It's not what anyone would have done in that situation imo. Brad US Bach picked no one and nothing said where the F1 told the F2. I give Britt credit for that because she still put her friendship first. That's not calculated, calculated would be her putting herself first and keeping it to herself and pushing for her winning. She didn't. She could have played up her being the last one there, not said anything to Sophie, and thus the last moment of the finale all about herself and her own blindside. Instead she chose to share that moment with Sophie and by doing so, Sophie benefited the most by being part of the sympathy. If it was just Britt at the end and that's all shown, her in the limo putting on a bigger show crying her eyes out etc like she could have, she'd have had ALL the sympathy focus on her and her alone. She didn't. Even her SM (her sister) we sleuthed was indicating that Britt was not chosen/not with Nick. As was Britt's posts of support for the other women on the season. To make it more about her and be calculated she'd have played up winning more but she didn't which was a huge red flag while sleuthing that somethng was off. So I don't see Britt as this calcuated contestant and at worst, Britt was no more calculated than the other F4 imo. Just had a thought, last year they had contestants from the US show so they may have some this year too. Will have to keep an eye out for that as well. @Sundy good catch I could see Emily Dibden on the show and perhaps later if not part of the original cast. *edit* Britt's also boring, which is the worst crime of all on a TV show. I also don't think Brooke is all she's cracked up to be either but she's more interesting (to me) so I'd rather watch her. Now Cass, she's truly goodhearted and pure imo. And Sophie is rougher around the edges but far more entertaining. @AllAboutLove wrote: Just had a thought, last year they had contestants from the US show so they may have some this year too. Will have to keep an eye out for that as well. Yeah I had Emily on my list of suspects and also wondered about the internationals. Bumping the speculated cast list up to here - not sure if we should add anyone from Sportsbet's list considering I don't believe many of those people will actually be there. ETA: I'm adding Wesley to the list of boys since he was hanging with Rob and Dan today which is suss IMO. Any others? @Bobette wrote: So this is who I'm thinking - what do we reckon? Have I missed anyone? More boys to come from Ali post-elimination obvs. I wonder if we'll get any internationals??? She is ridiculous! When people are saying that there are worse things that can happen, they're not making fun of mental health awareness, they're calling her out for pitching a fit because she didn't get to go on a free holiday! And also to the point, if her mental state is that fragile that this can mess her up this much, it would be irresponsible of production to put her into a stressful environment like filming a TV show, and she would be the first one to call them out if they put her on and she suffered mental health consequences from it. IMO she was tentatively booked as a spare bi girl in case a bigger fish (Brooke/Alex/Megan/Elora) with bi potential fell through, and they cut her when they got their first choices. @Dirty Street Pie wrote: IMO she was tentatively booked as a spare bi girl in case a bigger fish (Brooke/Alex/Megan/Elora) with bi potential fell through, and they cut her when they got their first choices. ETA: Wouldn't you just love to get a look at TPTB's "vision board" of all the potential hookups? In my head it's like something off CSI with photos of all the contestants and criss-crossing red strings connecting them together like suspects in a murder case. 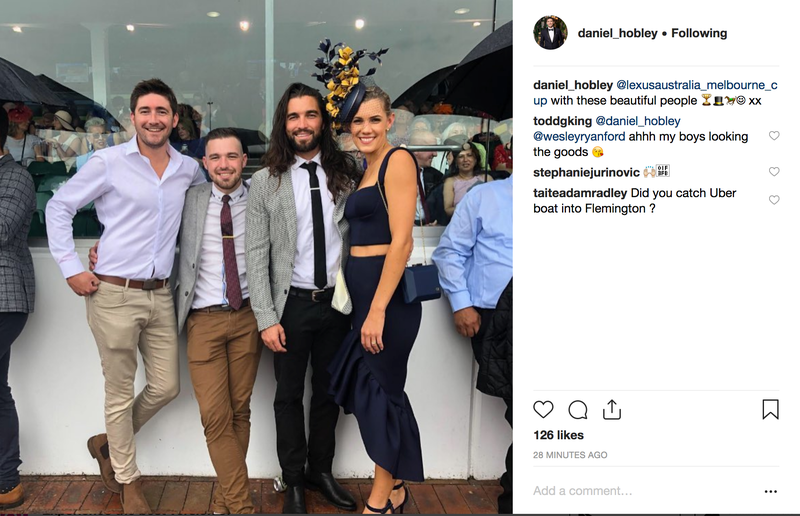 Dan and Wes are at Melb Cup. I'm wondering if Wes might not be in Paradise considering he looks *friendly* with the blonde. ETA: Scratch that - she's his sister! Sophie is in Syd, Britt in NZ and Brooke in WA. Cass, Shannon, Nathan, Luke, Jimmy, Alex, Megan, Rob & Ivan have all gone quiet so I'm wondering if they might be the first "batch" to fly out. Dasha has been posting all day (guess her invitation got lost in the mail ) Has anyone noticed any other contestants dropping off the radar? Cat had also been quiet after having her hair and brows done, so could be in the first group. Alisha posted a photo today, but not sure if it was really from today as she was at the hairdresser on Saturday, but her hair in the photo doesn't look freshly coloured. James was liking things on Insta this morning, but has otherwise been quiet. What's the thinking on letting have their phones on BIP? It's obviously not as tight a ship as the main shows, do we think prods are ok with them using their phones as long as they're not posting up a storm with their new besties in Fiji? Or would same rules apply, and no phone use till you're out? I think because there's no f1 when it comes to BIP and lots of multiples and chances for many couples (some may just be friends) that TPTB are much more lax. Even after filing last year the couples were out in public together. BIP US is also like this with BIP and way more lax (couples out and about post-filming in public whereas Bach/eye leads and their F1s aren't allowed to be with each other in public post-filming).